The adventure that is Nausicaa takes place in a post-apocalyptic future 1000 years after a catyclysm that has forced mankind to live around the fringes of a great forest of huge poison fungi known as the Sea of Corruption. Although most of the story is set in the Valley of the Wind, a place made relatively safe from the forest's virulent spores by a constant sea breeze that is channelled and amplified by the valley's high walls. The Valley's residents have created a little agrarian niche for themselves, largely ignorant of what goes on in the outer world. And when things go haywire, it's up to the courageous princess Nausicaa to inspire her people to protect what is their own. The video quality of this disc is rather impressive, considering that it was made in the 1980's and everything has been animated perfectly. Match that with a very in-depth and engaging soundtrack and this movie is truly a masterpiece that almost matches the Princess Mononoke. As with all good anime DVD's, this disc features a rather cheesy English dub but fortunately if you are a true fan, watch this movie in its traditional language. 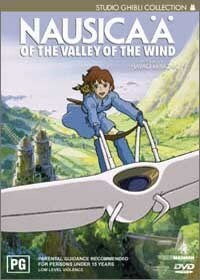 The special features of this disc include a 16x9 widescreen presentation, alternative angle storyboards, original Japanese trailers and the birth of Studio Ghibli. Great stuff!